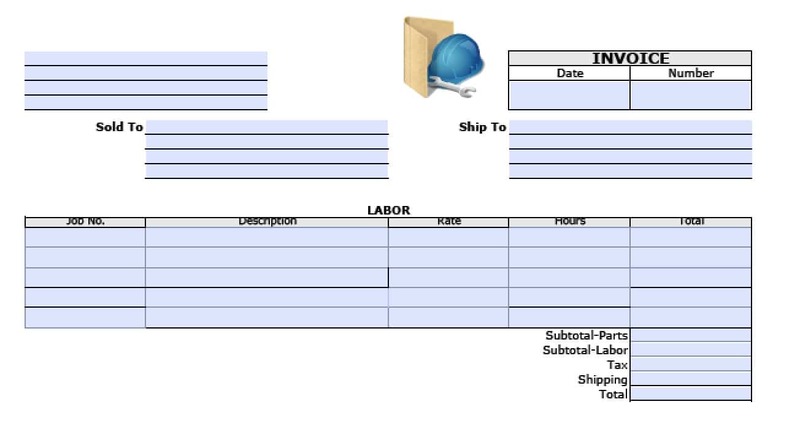 Download the general labor invoice template to request payment for many types of labor, including construction, plumbing, maintenance, and related work. The invoices should describe the work specifically enough so the customer understands what services are being charged and the costs involved. Step 2 – In the top left table, enter your name or your company name followed by your address and other contact information. To the right, enter the date of the invoice and the invoice number. Step 3 – Fill in the name and contact information for the person or company responsible for paying the invoice in the “Sold To” table. Then enter the name and address of where to send the invoice in the table to the right. Step 4 – Labor – For each separate type of work you’re billing for, enter a separate row in the table. Include any associated job number, the rate, and the number of hours, and then enter the total for each type of work. Step 5 – Add each figure in the Total column to get the subtotal for labor, add any charges for parts, taxes, and shipping, and add everything to get the grand total the client owes. Step 2 – At the top left, enter your company name and slogan followed by your address and other contact information below that. To the right, enter the date of the invoice, the invoice number, and the customer ID. Step 3 – Where it reads “Bill To,” fill in the contact information for the company responsible for paying the invoice. Then enter the name and address of where to send the invoice in the table to the right. Step 4 – Description – For each separate type of work you’re billing for, enter a separate description in the table. Fill in the rate and the number of hours for each type of work, and then multiply to get the total for each in the amount column. Step 5 – Add each figure in the Total column to get the subtotal, add any taxes or other charges, and add each figure to get the grand total the client owes. Include any relevant comments such as due dates and specify whom to make payments to.